Intel is announcing release of the PCIe SSD 660p for consumers, representing the world’s first PCIe QLC (quad-level cell, or 4-bit) SSD for consumer use. Intel is positioning this drive to be an exceptional combination of performance and value, and possibly a best value for entry and mainstream storage. The SSD 660p utilizes Intel’s 64-layer 3D NAND, which is the industry’s highest density NAND of this type in production. This allows for high capacities, with up to 2TB on a single-sided M.2 form factor in a thin and lightweight design. 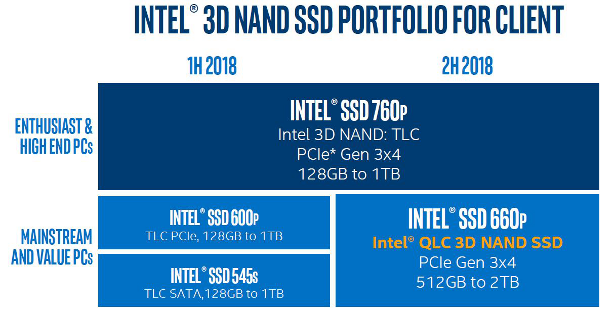 Anticipated for the second half of 2018, the Intel SSD 660p can replace both the Intel SSD 600p and Intel SSD 545s, which both feature TLC 3D NAND, and are offered in capacities from 128GB up to 1TB. 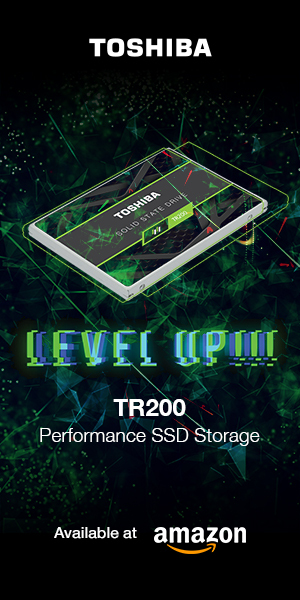 The SSD 660p will be offered in capacities of 512GB, 1TB, and eventually a 2TB version. 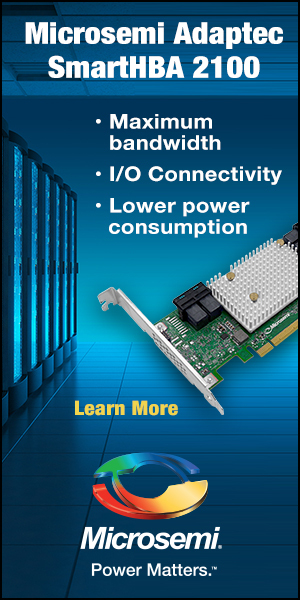 The SSD 660p features Intel QLC 3D NAND and a PCIe Gen 3×4 interface. Intel has performance-tuned the SSD 660p for common real-world workloads. Consumer usage tends to be clustered in workload bursts, separated by periods of idle time. 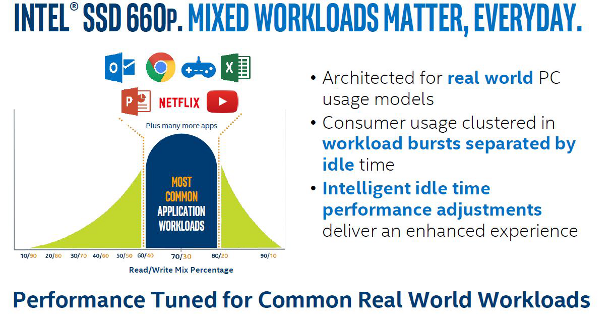 Most common workload applications for consumers tend to be at about a 70% mix of read/vs./write operations. Intel is utilizing performance tweaks during intelligenty-used idle times to enhance user experience. 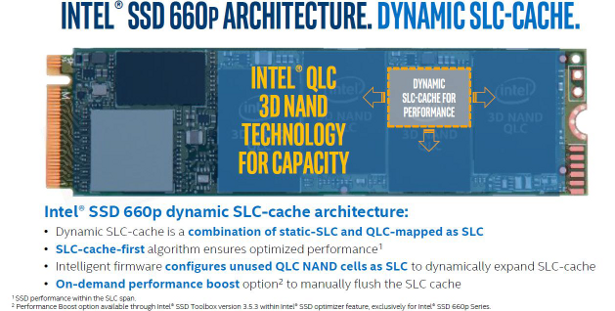 The SSD 660p also features a dynamic SLC cache to improve performance. The dynamic SLC cache combines static SLC with QLC that is mapped as SLC. The associated algorithm always utilizes the SLC cache first, with the firmware configuring unused QLC NAND cells as SLC to dynamically expand the SLC cache. There is also an on-demand performance boost option that manually flushes the SLC cache. 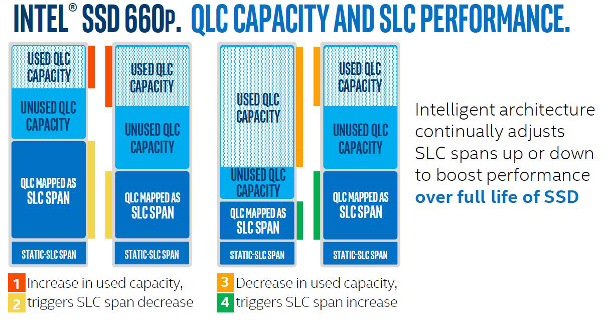 The intelligent architecture continually adjusts the SLC span up or down as needed to boost performance over the full life of the SSD, providing both QLC capacity and SLC performance. Studies have shown that 50% of all PC users store 235GB or less of data on their PC. With 235GB of data stored, the 512GB version of the SSD 660p would be utilizing 55GB as an SLC cache, while the 2TB model with 235GB of data stored would increase the SLC cache to 280GB. Workloads will remain within the SLC cache at lower capacity usage levels, with short-burst synthetic & random read/write spans and application-based benchmarks (such as PCMark) performing better than with SATA drives. Sequential reads and random reads will perform well when reading from either the SLC cache or from QLC. Workloads may exceed the SLC cache when the drive is at 75% used capacity or more, and the static SLC cache may result in QLC write speeds, which may be a bit lower than TLC write speeds. Intel is pricing the SSD 660p very aggressively, with the 512GB version at an MSRP of only $99.00. The 1TB version is priced at $199.00, resulting in both drives being priced at less than .20/GB! Compare this to other Intel consumer SSDs: The PCIe TLC SSD 760p is at $199.00 for the 512GB model, and at $374.00 for the 1TB version. The SATA SSD 545s is priced at $164.00 for the 512GB model, and $319.00 for the 1TB version. Intel’s SSD 660p also features AES-256 encryption, and support for Pyrite 1.0 and 2.0. Intel’s renowned reliability allows them to back the SSD 660p with a 5-year warranty.